This is the story of how I proudly became a bag lady. It starts off as kind of a downer. You know, losing my job and all, but it has a happy ending. Promise. And it’s an ending I hope you’ll love enough to work into your own holiday celebrating. Once upon a time, there was a mama who lost her job of 8+ years. This came just before the holidays, adding to the stress and sadness of it all. At home, she had a new(ish) one-year-old baby girl, making the Christmas season more magical than ever. Unfortunately, it also happened to make the layoff that much more stressful. How was Mama Meg going to make Christmas happen when her funds were just cut in a major way? Phew! Glad we got that cleared up. Let’s continue. Suddenly, Mama Meg was without the money to enjoy extra holiday outings and gifts and all of the things. “Whatever will I do for my little princess,” Mama Meg sighed. Luckily, MM’s current predicament wasn't the worst thing in the world. You see, MM enjoys a challenge and an opportunity to use her creativity to problem solve, and that’s just what she set to do. She would make the holiday season merry and bright one way or another. One day, while in ye olde Target shop, MM happened upon Christmas books that only cost $1. This was back in the magical days of the DOLLAR Spot, when all items were $1 in this part of the store. No, it’s true. This isn’t lore. Aww… the good old days! ;) Seeing the affordable book, MM had an idea. “I’ll give my princess the gift of books!” One Christmas book each night in December, to be exact. 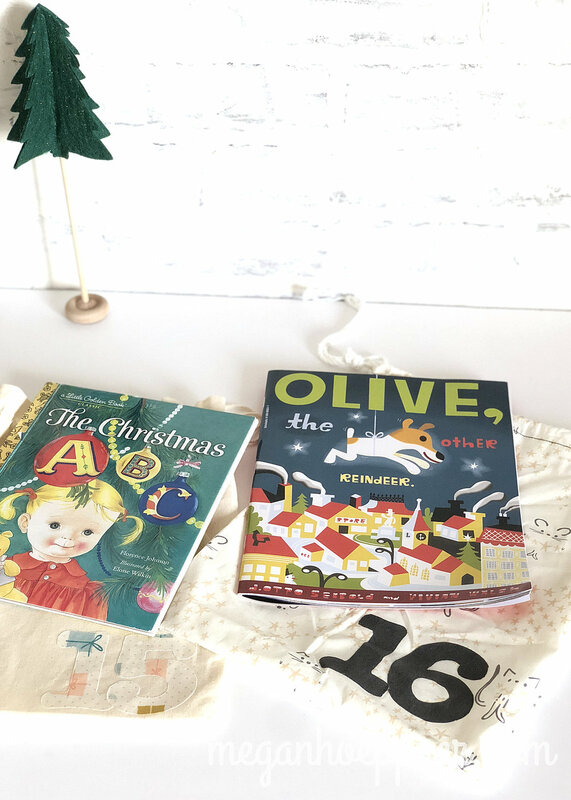 Just like that, the Advent Books tradition was born! I did a combo of handmade bags and amazon-bought canvas bags. The fun thing about the handmade is you can make them in any color scheme you want. I went with pastel Christmas to complement the trees in my girls’ rooms. To my bags, I added die cut numbers (actually the same numbers I used when I made my monthly onesies). I simply ironed the numbers on by first treating the back of them with a fusible iron-on webbing. Target. While the “Dollar Spot” may be a thing of the past, they still have the “One Spot,” which often includes $1 board books. These are especially good for younger babes, but even school-aged kids can appreciate them. Dollar Tree (or your version of a dollar store). They have an entire book and coloring book section. Many of our books came from here. FB area yard sale pages. Warning: These can become highly addictive. It’s so much fun finding a person looking to offload their old books. I scored some AWESOME vintage Christmas books this way. Traditional yard sales. These are harder to come by this time of year, at least in these parts, but if you live in warmer waters (lucky! ), this is another great place to score stories. Library sales. Once a year, our city library has a massive book sale. They practically give their books away at these, making it a gold mine for this project. Schoolastic book orders. If you have school-age children, the little pamphlets that come home with your kiddos are a honey hole of bargain books. I updated our collection quite a bit when Maggie started kindergarten (and kindermusik). Of course, you don’t have to rummage and scrounge as I did to make this fairytale a reality. That’s just the boat I found myself in when I set this tradition up. Anymore, I LOVE to visit local book stores and add a new book or two each year. It helps keep them age appropriate for Maggie, too. One of my favorite spots here in Salt Lake is Storybook Nook at Gardner Village. If you’ve seen You’ve Got Mail, it’s kind of like that. The owner loves books and brings in the cutest stories. There’s always a special seasonal assortment on display just as you enter the store. Now that you have your books, it’s time for a plan. Ask yourself if there are any other holiday traditions that could impact your book opening order. 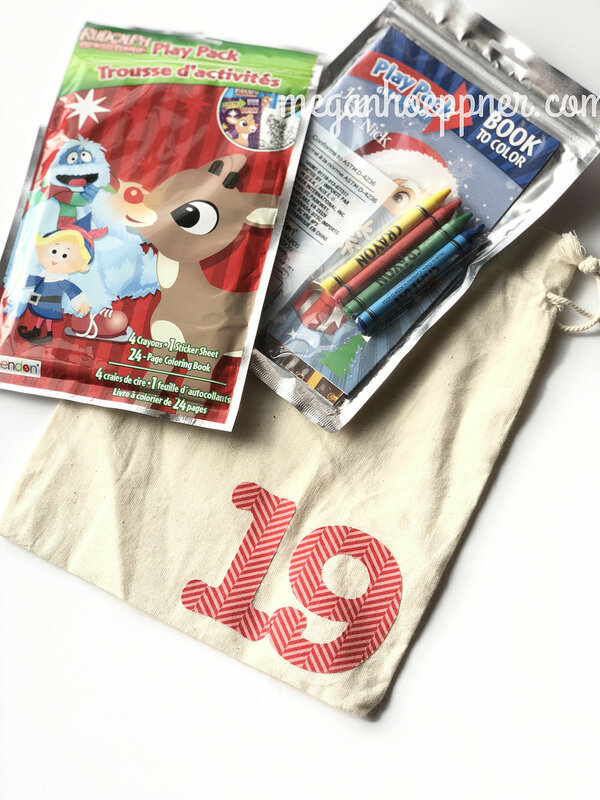 For example, I always give my girls an ornament on Dec. 1, which just happens to be Book Bag #1, so I put the smaller ornament bags in Book Bag #1. 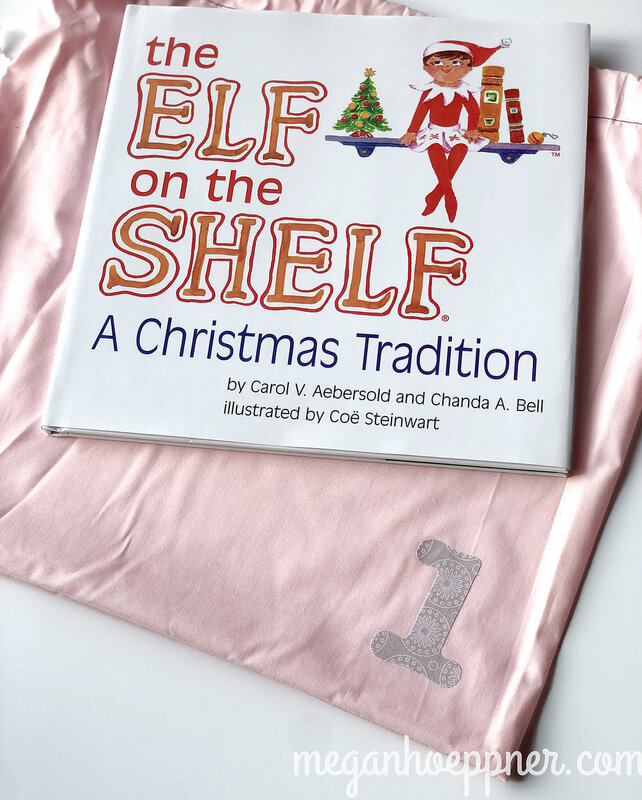 Book Bag #1 also contains our Elf on the Shelf book. It’s something we get going at the first of the month, so it makes sense to have it first. 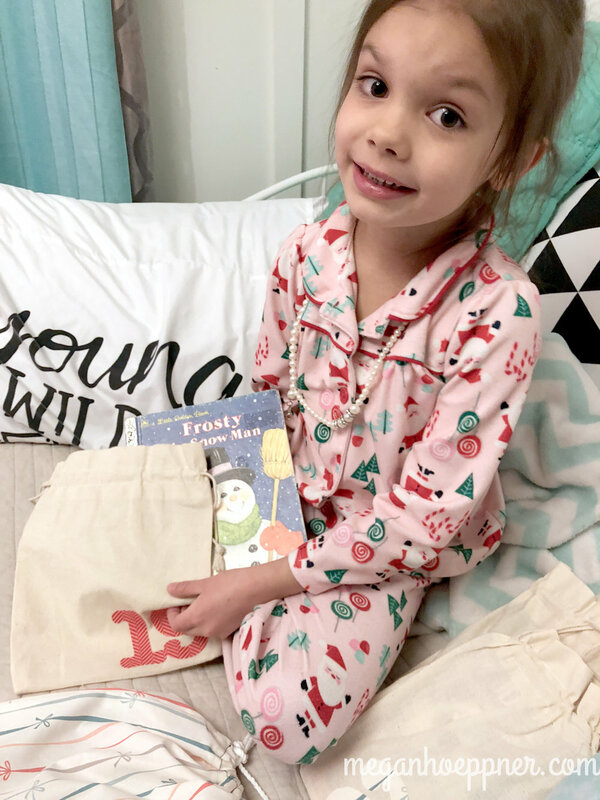 On Christmas Eve, we read The Night Before Christmas and open new jammies, so that book and the jams can be found in Book Bag #24. Occasionally, I work other surprises into the bag, such as little coloring books or a holiday movie. I try to do this rarely so I don’t have to replenish my stock from year to year, but it is a nice change of pace on weekend nights. Each of my girls have their own small Christmas trees in their rooms, so we put the books ‘neath their trees. It makes it super easy to open one at bedtime and snuggle in for story time. Now that I have two kiddos, I split the books. Half are under one tree and the other half are under the other. We just move from room to room to read. Perhaps I’ll eventually have enough for each kiddo to open a book each night, but I don’t think that’s necessary. Opening and reading together is fun. As Santa would say, sharing is caring! Thanks for seeing this story to its end. I hope it leaves you feeling inspired.